I’ve been dreaming about the day I could start a garden ever since I moved out of my Dad’s house to go to college, almost 6 years ago. When I was younger and living in New Jersey, my Mom had a huge garden (in my eyes at least) and she also had a compost pile near the back of the yard. I remember saving eggshells and vegetable scraps for her to take to the pile, and I knew that it produced fertilizer for our garden, but I didn’t know how or why. Now that I finally moved into a house with a back yard, I am excited to learn how to garden and start a compost pile of my own! The first step is to decide what kind of pile you would like – one made from scratch, or one contained in a bin. Luckily, my house came with a basic compost keeper in the backyard, but you can start a compost pile from scratch, without a bin, if you have the proper space for it. 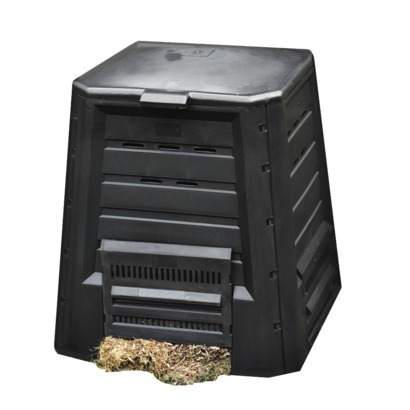 Basic compost keepers similar to this one are sold at stores such as Target and The Home Depot. Most are made from 100% recycled plastic, offer ventilation on all sides, and access panels at the bottom to retrieve the fresh compost. Compost can be mixed in the keeper with a pitchfork or gardening rake. Wooden compost bins, such as this one, are also available. This bin, made of weather-resistant cedar wood and chicken wire, has two large sections so that you can keep two compost piles going at once. This is a great option if you often compost leaves, which take up a lot of space. The cedar slats are adjustable to allow easier access to the piles. 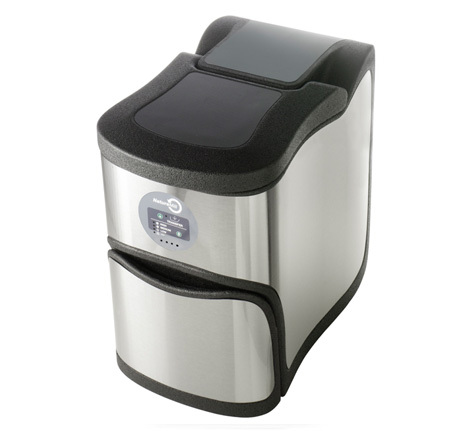 The next step above the basic compost keeper is a compost tumbler. This one features an aerated internal bar that mixes the compost and allows airflow. The tumbling feature is a convenient way to mix the compost without a rake or pitchfork. Of course I found the top of the line composters while researching as well. Automatic composters are electronic and can do all of the work for you. They are even offered in sleek, stainless steel designs that can sit right inside your kitchen. They are odor free, and ensure that the compost is kept at the correct temperature to speed up results. Choose an area that is fairly level with good drainage, so that the pile does not sit in standing water when it rains. Find a location that is in the shade for half of the day, and in the sun for the other half. If the pile gets too much direct sunlight it could dry out, but if it gets too much shade it might not receive enough rain water, or it might remain over-moist. For convenience, keep the pile close to a water source and at a convenient distance from the house. The best case scenario would be to start a pile at a corner or edge of your garden, so that the rainwater that drains from the pile can carry nutrients to the vegetables. Keep the pile away from pet areas, as pet waste can contaminate it. Do not place the pile near wooden buildings, as the process of decomposition will attack the walls just as it will the materials in the pile. Once you have selected an area, you will want to build some sort of structure to contain the materials. One suggestion would be to build a small (3-4 feet wide) “cage” from chicken wire, welded wire, or plastic gardening fencing. You don’t want it much bigger than 5’ x 5’ because it will become difficult to turn and maintain. Compost bin made of chicken wire. You could also build a container out of wood; even four boards connecting to make a square would work. Keep in mind that the wood will need to be replaced as the pile decomposes it. Recycled pallets are a great way to create a DIY compost bin, too. We’ll discuss what and how to compost in Part II. Stay tuned!